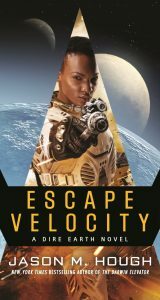 kt literary » Blog Archive » Happy Book Birthday ESCAPE VELOCITY by Jason M. Hough! Happy Book Birthday ESCAPE VELOCITY by Jason M. Hough! A huge round of congratulations to New York Times bestselling author Jason M. Hough whose ESCAPE VELOCITY hits shelves today! The next in Jason’s epic DIRE EARTH series, ESCAPE VELOCITY is part two of the thrilling action-adventure sci-fi duology that started with last month’s INJECTION BURN. SOLD! TV Rights! Check out the Hollywood announcement for this exciting series. Captains Skyler Luiken and Gloria Tsandi (and their respective crews) have smashed through the deadly Swarm Blockade but now find themselves scattered around the planet Carthage and the space stations she holds in her orbit. Their mission is now twofold: destroy the military compounds of a race of nefarious alien overlords and find a way back home to Earth. Standing in their way are a race of horrifying, technologically advanced aliens armed with incredible weapons. Low on supplies and with their ability to communicate compromised, the surviving humans must rely on all their cunning, strength, and plain old good luck to turn the tables and overcome their foes. ← Glowing Kirkus review for AN ENCHANTMENT OF RAVENS!